With the heat of Summer being upon us in Mumbai, my resolve to cook anything has evaporated like a puddle of water in the sun. The problem being that as much as I love salads, I get bored of eating the same thing all the time (that is the same problem I have eating Indian food at all meals...just can't). The good thing with the continental cuisine repertoire is that apart from having many salad options, it has great variation on the Sandwiches theme , and when you don't feel like eating these, there are still what the French call canapé. They can be bite size, as they often are in the case of cocktail and party ones. Or, they can be of a more substantial size, as in sliced bread size. Canapés are basically an open sandwich made of savoury things and veggies artfully placed on top of a slice of bread or a cracker that has been buttered...or cream cheesed. The prawn canapé above is a taste from my childhood. My mom never made these, but they are a popular choice in supermarkets and department stores cafeteria as a light lunch bite. And, of course are available in the supermarket itself, fresh and ready made in the "traiteur" section. It is not that they are difficult to make, but they take a little prep time and setting time as the prawns are coated in a gelatin aspic that need to set. Then the canapé is of course better enjoyed chilled so you need to include a cooling time. That said, it is not a daunting task if you plan right, and will only have you in the kitchen for about 10 minutes and therefore can be planned in the cool hours of the day and be ready for lunch. Normally the gelatin should make a thicker coating on the prawns, but the gelatin powder I had home was in a clear pouch with the instructions gone, so I might have put too much water, or not enough gelatin. It still ended up binding the prawns on the bread fine enough. - 4 slices of bread - some butter - 2 cups of frozen medium prawns - some gelatin powder - chicken magic masala cube - dill, parsley and lemon to garnish - some mayonnaise. Start by buttering your slices of bread and put them in the fridge until you need them. Then steam your frozen prawns in a steamer for about 4-5 minutes, the prawns should be pink but not shrink too much, shrunk prawns are the signs they are over cooked. Once your prawns are cooked, rinse them in cold water and set aside. This step can even be done the night before and the cooked prawns stored in the fridge. Prepare your gelatin according to the package instruction, add the chicken cube to the water, and let it cool a little without it setting too much. Add the prawns then and let it set slightly but do not leave the prawns to gel inside the jelly. You can check that with a spoon, the gelatin should be a bit runny still but looking thicker. Take your slices of bread out of the fringed and with a spoon place the prawns on them without adding too much of the still runny jelly. 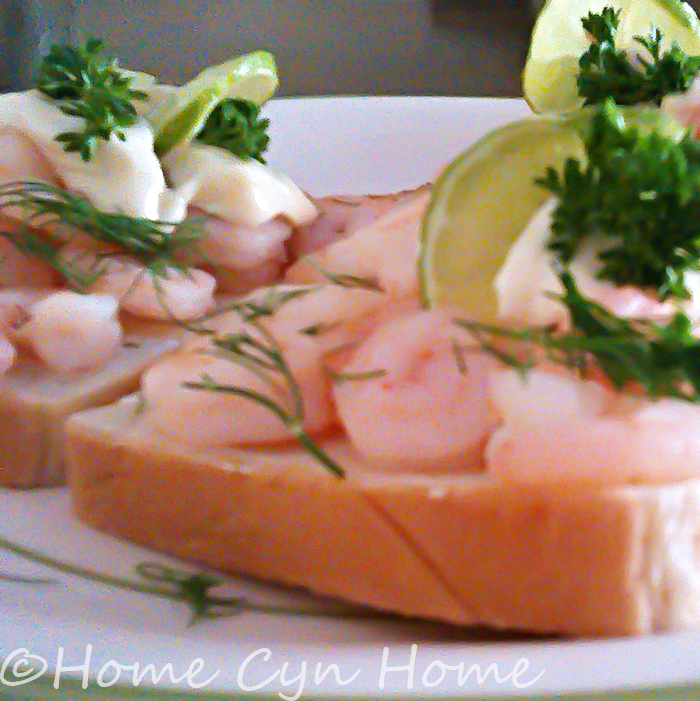 Once the prawns have been placed on the bread, add a little of the gelatin on top, drizzling the prawns. Put it back in the fridge for it to cool and set completely. Before serving, snip some fresh dill and sprinkle over the prawns. Then, add a dollop of mayonnaise on top, put a little parsley on top of the mayo and arrange a thin slice of lemon on top...voila, your canapé is ready. It pairs well with a salad if you are having just one slice of bread, or you can make it a meal by eating more than one.